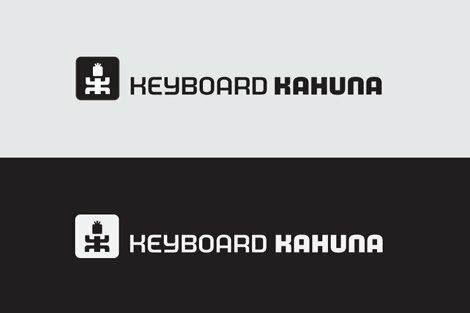 This logo design process for Keyboard Kahuna has been fun to put together, lots of images showing the explorations needed to end up with our final result. Although from the start, Thomas and I both agreed on the basic route, the project still took ages and many rounds of tweaking before we were both incredibly happy with the result. Often hard to imagine so such much work going into a logo design project, more so when the final logo design is so clean and ‘simple’. This is often the way, a logo design process post helps put the whole project into context, to see the amount of work required behind the scenes. The first image and one below show the final result in black and white, the single line horizontal version being the main version. 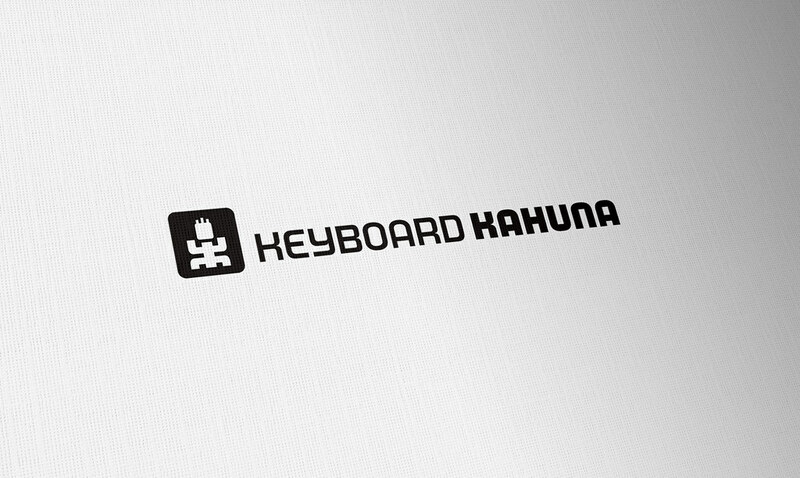 Keyboard Kahuna is stuff for geeks and macheads. Thomas Borowski is the chap responsible for this idea, a shop for products based on keyboard shortcut reference charts. These products will have keyboard shortcuts for various Mac software printed on them. Products will include laminated charts, reference cards, foldouts, posters, and possibly mouse pads and t-shirts. 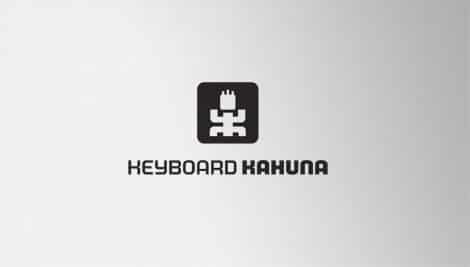 As Thomas pointed out in the brief “The name Keyboard Kahuna should imply a person proficient in using the computer keyboard compared to someone who prefers to use the mouse. A “Kahuna” is the Hawaiian word for “priest, magician, expert” etc. but also refers to the “best surfer on the beach” (see Wikipedia). 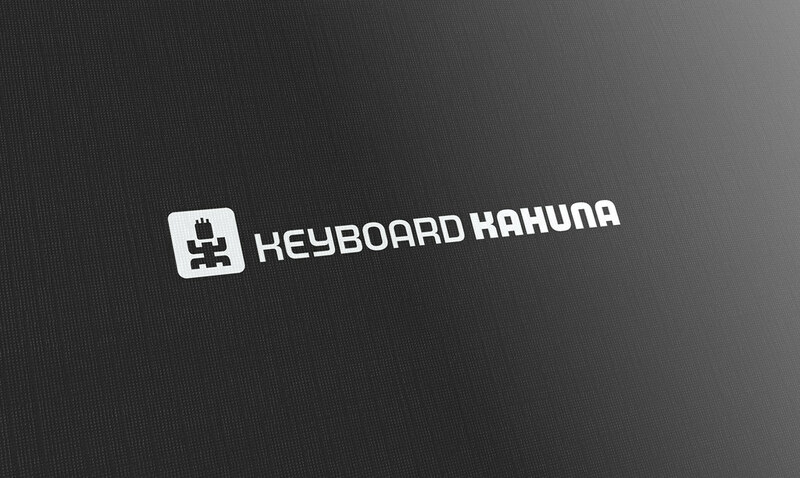 So the implication of the name and the logo should be that using the products will make you an expert at using keyboard shortcuts, hence a “keyboard kahuna”. The finished logo needed to be clean, simple, bold yet pretty cool.Truly flexible for printed on various materials and at different sizes. Nothing complex, too detailed or intricate. Thomas approached me around late January, he had filled in my online quote form in detail. When I first read the details I felt a sense of excitement, I love the idea but also a sense of dread. From the outset my immediate fear was the work ‘kahuna’, having seen various incarnations of ‘kahuna’ in other logos, signs and arcade games, it was essential to avoid the ‘usual’ bright and mad style, but still retain a sense of Hawaiian flavour. It’s one thing to be aware of avoiding cliche’s, but can be quite another making it happen. 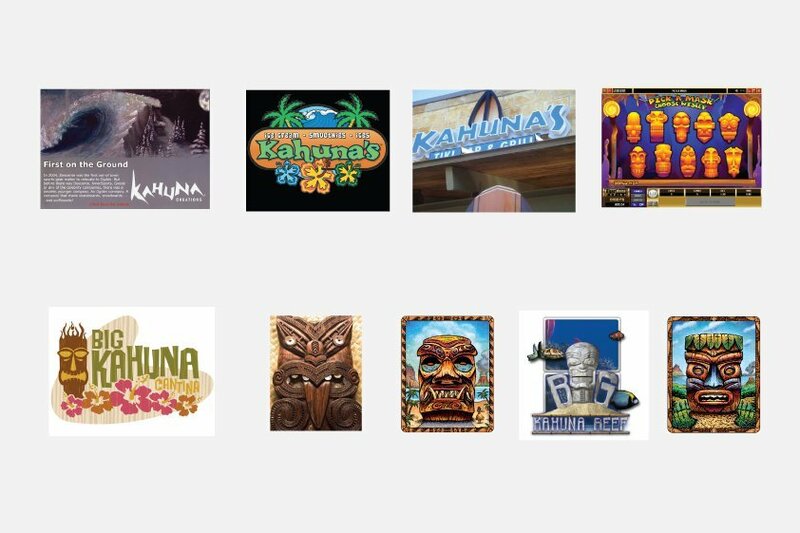 A Google search for Kahuna logo resulted in some expected imagery, you can see the general style below. I also researched kahuna masks, as this was suggested by Thomas as a basis for the general feel of the logo, so getting feel for how these masks proved to be helpful. You can see some examples of the masks below. From the results of various Google searches and other logo design inspiration sites, Thomas and I figured on one safe route to take, which would ultimately minimise the common design style given to anything Kahuna. From the beginning, we pretty much knew that the logomark would be formed from the initials. Fortunate here with the letters, the ‘K’ is a perfect base to transform into a ‘person’. One ‘k’ is helpful, having two meant the logomark was built entirely from the initials. Flipping the left ‘K’ means you get the perfect shape, for legs and arms. The trick was to shape this in such a way that it had a Hawaiian flavour and still resembled the letter ‘K’. A few sketches was all that was needed for this project. I did explore some more diverse shapes, but the focus was on creating a logomark that would hold detail at the Favicon size of 16px. This was very important, the design needed to be kept clean and simple, yet not boring or dull. Only so much I could do at this point on paper, so took the project back to Illustrator. With a clear idea of the direction, tweaking the shape to optimise legibility at small sizes, keep the Hawaiian kahuna feel whilst avoiding any cliche meanings proved to be the time consuming challenge. Thomas is a great guy, very down to earth and it was a pleasure to have him as a client. With no real time pressures, we both went with the flow, under no real pressure means you can afford to sit back from time to time. This is important to allow certain ideas to sink in. The development of the icon took some time. A few times we thought we had cracked it, then after a day or so, we would both realise it wasn’t quite there. We certainly seemed to be on the same wavelength. An example of thinking we had cracked it is demonstrated in the example below. Looks similar to the final logo design, but look closely at the ‘head’ in the logomark. Thomas showed this to a friend, and his comment was that the head looked like a bin-bag, with the draw-cords as the hair. After I heard that comment I saw it immediately. So changing the hair to vertical strips instead of angled removed the bin-bag association. The other challenge was the relation of the logomark to the wording. 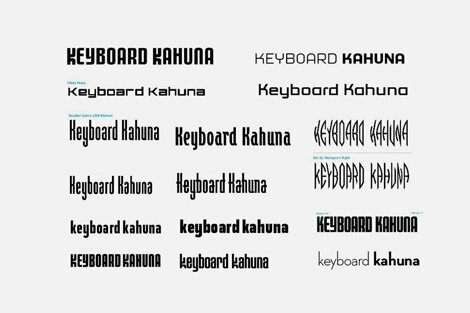 I looked at a number of fonts styles, the trick was to find a font had a certain flair to it, that would fit with the saying of ‘kahuna’. Typically more condensed or squared seemed to be the most promising route. Some fonts had quite stylised K’s, so close to a body, arms and legs. The first example here shows what I mean. Flip this font and you get a solid reference to body, arms and legs. The font decision also proved to be quite time consuming. Usually this is a part I like to focus on from the beginning, I tend to know in my head what will work best from the outset of the brief. Although we had a good idea with the basic font style, the details proved to be the sticking point. The font we liked, didn’t fully work when the ‘k’ was literally translated to a logomark. The results changed significantly if you used a medium or bold weight as well, throwing previous decisions out of the window. It’s hard to explain fully the backwards and forward dance we did at this stage. Too bold and the nature of the fonts we had shortlised would just fill in at smaller sizes, thus rendering the logo a little unreadable. Too thin and it lacked substance. The first font above was out initial favourite. As the stylised ‘K’ worked the best when made into the logomark. But the problem was that the medium weight was too spindly to form a kahuna character, where as the bold weight was perfect. Which ideally meant having to chose medium or bold as the basis for the logomark. In the end we realised that the first example would work best for the logomark, but didn’t look right for the wording. So our intended idea to have the ‘K’ being a common image in both the icon and wording had to be cast aside. Instead opting to mix and match. We ultimately used the second font below for the main wording, and the letter ‘K’ from the top example. But this decision was the hardest and we just kept going back and forth with it. The final font choice was MorganBig from the huge Morgan type family, from the Feliciano Type Foundry. 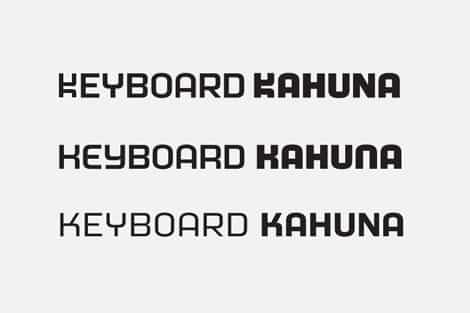 Using two weights, MorganBig Extra bold for ‘Keyboard’ and MorganBig Medium for ‘Kahuna’. Optimising the icon to work at various sizes meant we had to keep adjusting the negative space between legs, arms and head and shoulders so it didn’t fill in at small sizes, specifically 16px. You can see how even a relatively simple image struggles to hold the sense of space and detail. We also looked closely at the hair style, trying to find a thickness of hair that worked adequately at much smaller sizes. We even considered using a logomark without hair at 16px, but this didn’t work. The final version uses the first column, with squared hair. Also looked at detail in the face, but I felt just a solid face at this point proved to be the cleanest option. If it didn’t have to be reduced to 16px, then we could have played with incorporating more detail. Although we looked at various colour options, Thomas decided early on to keep it mono, or at least shades of grey. Being a fan of mono, I was more than happy with this decision, but the option to add colour is there and easy to implement further on down the line. The reason for the rounder corner square container was reasonably easy to justify. It’s not just to keep the logomark contained, it’s a visual reference to key’s on a keyboard. So this was a easy visual association to incorporate. The head is just a reduced version. The following image shows the alignment and spacing. The dark grey vertical bands shows the equal width of spacing from the edge of the icon to the box edge then to the start of the wording. The ruler lines show that I have kept the height of the main wording the same as the ‘KK’ body of the icon. The area where the vertical and horizontal guides intersect is a sqaure. It’s small details like this that help create a cleaner and more balanced logo. Choosing a logo designer can be a daunting task, especially if you’ve never done it before. I scoured numerous online portfolio sites trying to find logos that appealed to me to narrow down the list of designers I would contact for a proposal. When I stumbled upon Graham’s portfolio I immediately knew that I’d found my guy. The logos in his portfolio all have a very distinctive look and feel to them without being uniform in any way. His work has exactly the style I was looking for for my logo. The design process from my end was actually very laid back. After I had sent my brief to Graham and we had discussed the details via Skype, all I had to do was crack my whip and Graham would jump through the hoops as told. Seriously though, he didn’t really need all that much guidance from me. I think he knew pretty much right from the start what I was looking for. His first couple of design drafts already pointed in the general direction we later took. And the final result is a perfect match for what I had in mind. Overall, working with Graham was fun and inspiring and I whole-heartedly recommend him to anyone looking for a truly unique and professional identity design.